What neither Samuel nor the corporation suspected was that the 17th-century oil painting, which depicts a scene of seduction watched by an enthusiastic spaniel, was seized when German forces blew open a bank vault in Arnhem in the Netherlands. The corporation will return the painting to the heirs of the rightful owner in a ceremony today at Mansion House. The City of London is not obliged by law to return the painting because it is not a public body, but it agreed that there was a clear moral imperative after it received an exhaustive report compiled by the Commission for Looted Art in Europe. Anne Webber, co-chairman of the commission, a non-profit foundation, was able to prove that the £1.5 million painting was taken from J H Smidt van Gelder and that it should be returned to his daughter, Charlotte Bischoff van Heemskerck. 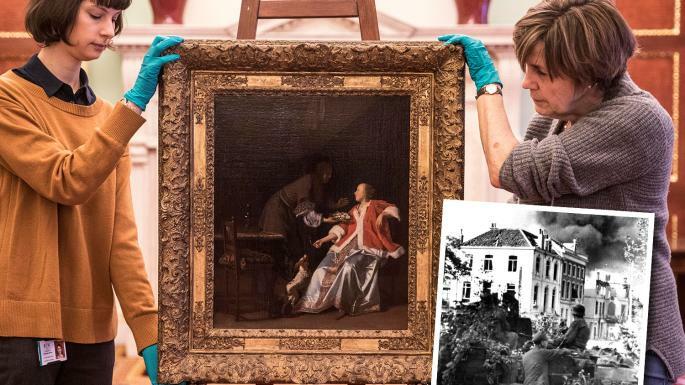 Mrs Bischoff van Heemskerck, 96, spoke of her delight at getting the painting back 72 years after it was stolen in the wake of Operation Market Garden, the British-led attempt to liberate Arnhem that was the basis of the film A Bridge Too Far. She rushed into the marketplace to get a Dutch flag to mark the liberation and welcome the Allied servicemen, but celebrations were short-lived. The ill-fated operation ended in failure after nine days, leaving residents to face Germany’s wrath at their disloyalty. The Nazis expelled all residents from the city before systematically looting it. Dr Smidt van Gelder, director of the children’s hospital in Arnhem, had sent 14 of his paintings for safekeeping in a bank, and his family hid another three underneath paving slabs. The pavement hiding place proved more successful than the bank, which was ransacked on the orders of Helmut Temmler, a former Hitler Youth leader and head of District Commando Düsseldorf. Temmler, who was given command of a quarter of Arnhem, was so brazen that Heinrich Himmler, head of the SS and architect of the Holocaust, described the bank raid as “shameless”. The fate of the painting after the bank robbery has emerged after years of detective work by Ms Webber, who had to work backwards from the painting’s arrival at Mansion House as part of the Harold Samuel Collection. Samuel bought the painting from the reputable London art dealer Edward Speelman who in turn received it from J William Middendorf, an American diplomat whose career included being secretary of the navy, US ambassador to the Netherlands and US ambassador to the European Union. Mr Middendorf, who is still alive, told Ms Webber that he bought it in about 1967 from Gallery Meissner in Zurich, but there the trail appeared to go cold. Ms Webber made a breakthrough when she discovered that the painting had been documented by Walther Bernt, an expert on Dutch paintings who helped the Allies to identify looted art after the fall of the Nazi regime. Ms Webber discovered that Bernt is also listed in Gestapo records (as Walther Berndt) as having helped them assess the art collections of Czechoslovakian Jews who had been sent to death camps. Bernt’s archive, held by Harvard University, includes a photograph of the painting with a label on the back. It names one of the owners as Gallery Peiffer in Düsseldorf — the city where the Nazi commander Temmler was based. A former owner of the Düsseldorf gallery recalled handling The Oyster Meal shortly after he began working for the gallery as an apprentice frame-maker in 1956. The painting stood out in his memory because the gallery specialised in German art from the 19th and 20th centuries and had only ever handled two Dutch old masters. Ms Webber’s conclusion is that Temmler or his associates offloaded the painting to the Düsseldorf gallery after the war and that Bernt, the Gestapo’s former stooge, was brought in to authenticate it. Bernt, who also had connections with the Zurich gallery, may have helped to take it to Switzerland. Ms Webber began her investigation in 2014 after the Dutch family decided to renew its search for the painting. Searching the internet for images of The Oyster Meal, she found three, each in reputable collections in Madrid, Rotterdam and London. The London version struck her as familiar. She arranged for the family to make a discreet visit to Mansion House, where Mrs Bischoff van Heemskerck saw the painting that once hung in her father’s waiting room. “I felt wonderful,” she recalled. 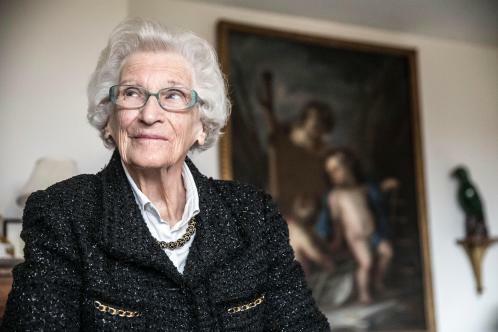 “It was unbelievable to see it after 70 years.” Asked where she wished to hang the painting after its return, she gestured to the wall behind her sofa. “When I have it, I will keep it as close as possible,” she said.